WARNING: On July 9, 2018, the U.S. Department of State advised against travel to Haiti due to civil unrest and crime, and that it may not be able to provide services to citizens traveling there. The Government of Canada advised its citizens to avoid non-essential travel to Haiti due to civil unrest throughout the country, and closed its embassy on February 14, 2019 because of the unrest. Note: The north coast of Haiti was lashed by Hurricane Irma on 7 September 2017, and in early October 2016, Hurricane Matthew wreaked havoc on large parts of Haiti, leaving behind more than 1000 dead and destroying homes and infrastructure on a large scale. Services may be affected. The country's health care system, trying to cope with a Zika outbreak and a cholera outbreak has also been impaired. Home to the country's most important cities outside the capital, as well as the foreign tourist's favorite beaches near Cape-Haïtien. 18.5425-72.3386111111111 Port-au-Prince — Haiti's big, crowded, and chaotic capital city. 19.75-72.22 Cap-Haïtien — the country's second biggest city, on the Atlantic coast near some beautiful beaches and interesting old forts. 18.234166666667-72.5347222222223 Jacmel — a relaxed town with a beautiful historic center and a claim not easily dismissed to be the country's artistic and cultural capital, albeit in ruins following the earthquake. 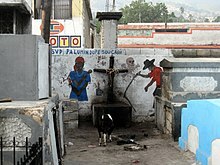 18.647222222222-74.1138888888894 Jérémie — Haiti's westernmost and profoundly isolated town is a sleepy little charming place. 18.2-73.755 Les Cayes — Southern Haiti's principal port and a popular jumping off point for Île à Vache. 18.093908333333-73.9256944444446 Port-Salut — President Aristide's birthplace, home to miles of gorgeous, empty white sand beaches. 19.78638889-72.245555561 Labadie - a private port used by cruise ships. WARNING: In 2019, Canada cautioned its citizens to "avoid non-essential travel" due to civil unrest throughout the country. The United States warned its citizens that "the ability of local authorities to respond to emergencies is limited and in some areas non-existent" as some visitors have been attacked, robbed, shot or killed. WARNING: Local medical care is woefully inadequate. Please consider if you get ill or injured whilst in Haiti you may need to leave or be evacuated. Cholera is not a problem for tourists, but for locals. Medical care remains limited. The Zika virus is known to be present in Haiti. Global Affairs Canada recommends travelers "[c]onsult a health care professional or visit a travel health clinic preferably six weeks before you travel." This country travel guide to Haiti is an outline and may need more content. It has a template, but there is not enough information present. If there are Cities and Other destinations listed, they may not all be at usable status or there may not be a valid regional structure and a "Get in" section describing all of the typical ways to get here. Please plunge forward and help it grow! This travel guide page was last edited at 08:40, on 19 April 2019 by Wikivoyage user Graham87. Based on work by Wikivoyage users Mx. Granger, Robkelk, AndreCarrotflower, Traveler100, JakeOregon, PlyrStar93, Traveler100bot and Hobbitschuster, Wikivoyage anonymous user 2607:FB90:8376:84B2:D8E9:3481:C0F1:9161 and others.